Jello desserts are great any time, but I love them that much more during the summer months. Then again, whipping up a jello dessert mixed with cream cheese and fruit, how can you beat that? The recipe I am about to share with you is also very quick and simple to prepare, and it makes a very refreshing dessert for your family barbecue, or a dish to pass at a neighborhood get together. I made this jello mold for numerous occasions, and I never had to worry about storing any leftovers…..it’s yummy! This recipe yields about 64 oz , which is about 8 cups (16 – 1/2 cup servings). Drain the strawberries, and mix into jello. Cool until partially set (the frozen strawberries will cool the jello very quickly). Mix in the crushed pineapple. In a separate bowl, mix the cream cheese with the sour cream, to a smooth paste, and fold into the jello mixture. Refrigerate until well set (couple of hours, or overnight). This is a great recipe! I may try to put a border of whipped cream along the edge to enhance the color and flavor. The whipped cream edge would look nice, but whipped cream does not hold very well for too long, so it might make it messy looking, once it starts to melt down. I would suggest to offer whipped cream on the side if anyone wanted to add some on the top of their own serving. Thank you so much Michelle, for pointing this out to me. I just updated my original post with the addition of the crushed pineapple. Michelle, thank you very much for pointing this out to me. I just updated the original post with the addition of the crushed pineapple. I appreciate your visit to my post and your input. Thank you for the valuable and interesting Post. Thanks!! You are very welcome, indeed. Please stop by any time. Just came across your post today, I had never thought of putting cream cheese with Jello. It looks so easy! And I definitely like the idea of no leftovers… this is often the case with desserts! I am glad that you found my recipe. This is a very refreshing dessert…less calories than ice cream or cake…. Fresh strawberries, most likely, will make this dessert a little less sweet, and maybe more chunky. Nonetheless, it will be delicious! Do you use sweetened or unsweetened frozen strawberries? I use unsweetened frozen strawberries. Since the Jello is sweet, the dessert would be very sweet with sweetened fruit….to my taste. Good luck with your dessert, and please let me know how you liked it. what is green on the top of the jello? is it mint leaves? Do u slice the strawberries?? I do not slice the strawberries. However, I use a mixer for mixing, so they do get broken up during this process. I went by walmart and they only had the frozen ones tht r slices…will those work?? So we don’t prepare the jello as said in their box we mix the 6oz jello mix in 1 cup of hot water?? Sorry Angelica…I did not get a comment notification for some reason….so did not know you had a question. I know by now it is “water under the bridge”….but in case you still are not sure about the cooking the jello in this recipe, you do NOT follow the package directions….it would be too watery…that is why you suppose to only use 1 cup of water to dissolve both boxes of jello into it. I hope yours turned out nicely and you enjoyed it. Do you drain the can of pineapple ? Yes, the juice is drained out of the canned pineapple, as stated in the list of ingredients. Thank you for stopping by my blog and finding it interesting. You can substitute it with low fat or no fat sour cream or yogurt. I tried a recipe tonight that is somewhat similar in that it called for cream cheese in hot jello. I knew to allow to cool a bit but the cream cheese NEVER fully melted. It remained in tiny white particles! Seems like you can’t allow mixture to cool too much or it begins to set up before the cheese in put in. The recipe also called for whole cranberry sauce and should’ve been delish. Had to throw it out. It never set up. Sorry to hear about your jello dessert failure. Since I don’t know what recipe you followed, I am not able to comment of the issues you encountered. However, I am able to tell you about my experience with MY recipe for jello/cream cheese dessert since I made it numerous times and never had a problem with it setting. I can only assume that you added too much water to the jello, since in my recipe you only add 1 cup of water per package of jello, unlike using 2 cups if you are just making plain jello. This way the jello is much thicker so the addition of cream cheese does affect it too much, and it will set. Also, you mentioned that you mixed cream cheese with hot jello….??? ?…in my recipe you whip the cream cheese with the sour cream to a light creamy mixture. 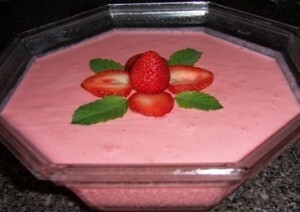 Then you mix this creamy mixture into the puree of jello and strawberries…never a problem…. I would like to hear your comments once you try this recipe…and follow the instructions in the order they are written. Thank you. I am afraid that might not work well….you need some other fruit to give it more body. If you don’t care for strawberries, you can use different flavor jello and other fruit….such as blueberries…but please note that FRESH pineapple will prevent the jello from jelling well…unlike the canned one. Please share your experience with us if you come up with your own recipe for this jello dessert. Thank you. Can you give me the approximate number of servings for this receipe? I am thinking of making this to take to a potluck. This recipe makes about 64 oz of jello dessert, which is about 8 cups. Good enough for about 20 people. I never made this dessert with sugar free jello, but I don’t see why not. Naturally it will not have the same taste, but if that is what you like then go for it and enjoy it. Thank you for reading my post and for leaving an interesting response.